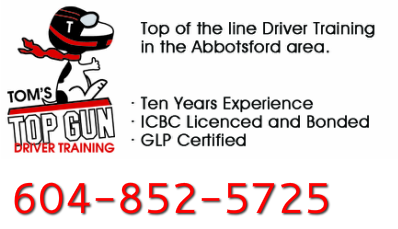 Tom's Topgun Driver Training - Tom's Topgun Driver Training School in Abbotsford, BC and surrounding areas. Learning to drive on today’s roads can seem to be a complex and unsettling experience. We believe that with a knowledge of driving regulations, correct observation and vehicle handling skills, learning to drive should be an enjoyable and stress-free endeavor. We offer Class 5 and 7 instruction in a clear and easy to understand manner. The driving skills that you will learn will help ensure a lifetime of safe driving in all driving environments. Our hours are flexible, and we will pick-up students at home, school, work, or any other convenient location. • When using our car for the Road Test, Tom’s Top Gun will book the test on your behalf. • We do not offer refunds on lesson packages. However, unused lessons may be transferred to another family member.